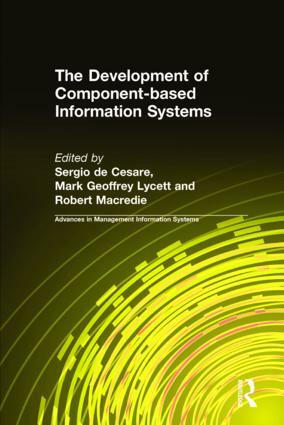 The Development of Component-Based Information Systems: An Introduction, Sergio de Cesare, Mark Lycett and Robert D. Macredie ; Part I. Component-Based Development Methodologies and Systems Architectures ; 2. An Approach to Component-Based and Service-Oriented System Architecture Design, Zoran Stojanovic, Ajantha Dahanayake, Henk Sol ; 3. Toward a Component-Oriented Methodology to Build-by-Integration, Ali Dogru ; 4. Principles of UML-Based Component Modeling, Colin Atkinson, Christian Bunse, Erik Kamsties, and Jorg Zettel ; 5. Designing Flexible Distributed Component Systems, William F. Acosta and Gregory Madey ; 6. Patterns, Pattern Languages, and Software Architecture for CBDi: The Lessons of the ADAPTOR Experiment, Alan O'Callaghan ; 7. Techniques and Strategies for Testing Component-Based Software and Product Lines, Ronny Kolb and Dirk Muthig ; Part II. Managing Component-Based Development ; 8. Organizing for Software Product Families, Jan Bosch ; 9. Business Engineering of Component-Based Systems, Marijn Janssen and Rene W. Wagenaar ; Part III. Component-Based Development with Commercial Off-the-Shelf (COTS) Products ; 10. Selecting Commercial-Off-the-Shelf Products, Hareton K.N. Leung ; 11. Trading for COTS Components to Fulfill Architectural Requirements, Luis Iribarne, Jose Maria Troya and Antonio Vallecillo ; About the Editors and Contributors; About the Series Editor; Index.